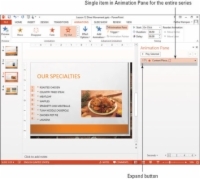 An exit animation in PowerPoint 2013 causes an object to leave the slide before the next slide appears. Without an exit animation applied, an object stays onscreen until the next slide appears. Exit animations are often used in combination with entrance animations to make an object enter, stay for a specified time, and then exit. When you animate a text box that contains multiple paragraphs, each paragraph is animated separately, but you can collapse or expand the group of animations in the Animation Pane. You can format them as a group when collapsed, or you can expand the group to format an individual paragraph’s animations separately. 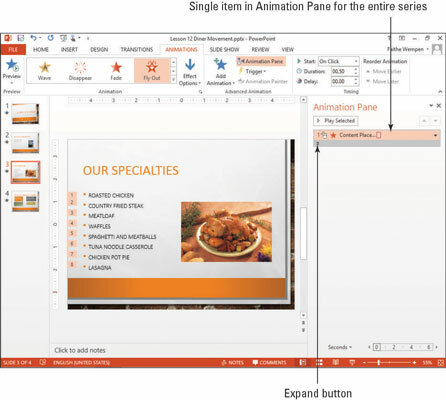 1Select slide 3 and select the text box that contains the bulleted list. Make sure you click the outside of the text box so that its border appears solid rather than dashed. 2Click the Animations tab and then the Add Animation button. In the Exit section, select Fly Out. The bulleted list is animated. 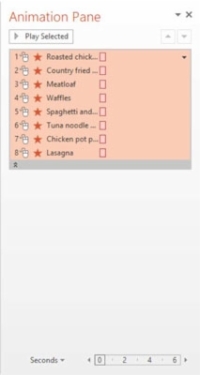 Numbers appear next to each item in the bulleted list on the slide, indicating their order in the animation. A single item appears in the Animation Pane, showing the entire animation sequence. 3Click the Expand button below the animation in the Animation Pane. This expands the list of animations in the group, as shown in this figure. 4On the Slide Show tab, click the From Current Slide button and click through the slide’s content. 5Press Esc to return to Normal view. You leave the Slide Show view.